Dear Mr. Crabby Chess Player. I am a low A player and I pride myself on combining an aggressive approach and a high degree of objectivity. If you must know, I am an actuary by profession. So I possess a good understanding of real risk versus perceived risk. I very nearly won this recent OTB game against an expert, and in fine style. Alas, he cheapo’d me on the queenside. I know that your honest evaluation of my annotations will help me break through to candidate master. 6. dxc5 Na6 His knight is dim on the rim. 9. Qd4 Qe7 My queen is active in the center. 10. O-O-O a6 With my king safe I am ready to surge forward on the kingside. Opposite-wing castling always leads to a race. 16. 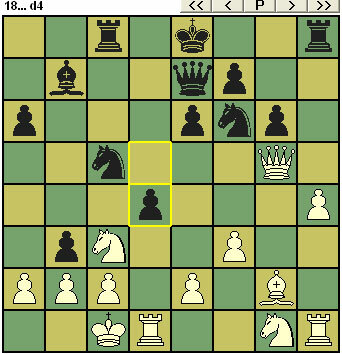 Qxg5 g6 Black has to burn a move on defense and now his dark squares are weak weak weak. DIAGRAM. Black blunders a pawn, but I figured why take this d4 pawn when I can spend the tempo bringing my knight into the attack? Wienerschnitzel. Despite my advantage in space I have fallen into a fork (21.Kd2 Nxe4+ nicks my queen). 0-1. Black was on the ropes – Where did I go wrong? Looks like your mistake was showing up. This unprepared lunge with g4 reminds me of watching a seventh-grade band dork trying to hit on the ninth-grade cheerleading squad captain. Do chess a favor and stick with life insurance. This may be the best Mr. Crabby yet. Black has to burn a move on defense and now his dark squares are weak weak weak. If there are weak dark squares in a forest, and a light-squared Bishop is there to take advantage of them, do they make a sound? Denys – MCOCP is more meanspirited than lyrical.